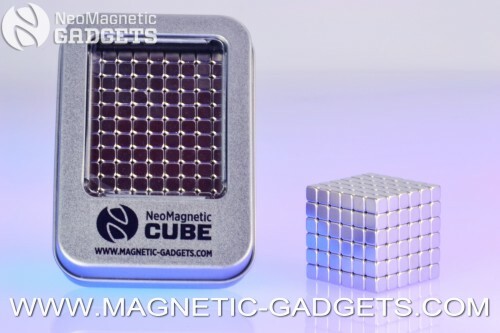 Made of 216 high strength, high quality Neodymium Magnetic Cubes this NeoMagnetic Square will keep you entertained for hours. Make them slide, glide, pop and snap, the NeoMagnetic Square opens up a whole new dimension of magnetic awesomeness! Let the magnetic properties of the 5mm magnetic cubes guide you and build a ridiculous amount of shapes. From pixelated geometric fractals to magnetic skyscrapers no matter what you do, the basic principles of magnetism and mathematics will let you build awesome shapes. Playing with this space age gadget is a truly unique experience, you have to try it to believe it! Size: 6 x 6 x 6 5mm squares, 216 5mm magnetic squares in total + a sturdy metal gift box. Coating: High quality triple coating NiCuNi (nickel, copper, nickel) offers the best protection available against chipping and corrosion. These are the some of highest quality Neodymium Squares on the market, their quality surpasses even the more expensive brand names. Trust us, we tried most of them! The coating on low grade magnets will chip quickly, exposing the Neodymium core which will soil your hands. Our NeoMagnetic Squares were custom made to meet the highest quality standards. The coating on these magnets will last for a very long time. It won’t leave you with dirty hands and the feeling that you’ve wasted money on a low grade item.